The most popular reason people form an LLC is to protect their personal assets. LLCs ensure that, legally, you are not held personally responsible for the debts and liabilities as a result of the company’s business. This avoids personal litigation, seizure of personal property, and bankruptcy. Paperwork for this type of company is not as demanding as, for example, incorporated businesses. An LLC can be formed by filing articles of organization and submitting a fee to the state but does not require filing annual reports, creating management bylaws, and other administrative work required when incorporating a business. Though the guidelines for running an LLC differ from other types of companies, they can be taxed as a sole proprietorship, partnership, or corporation. 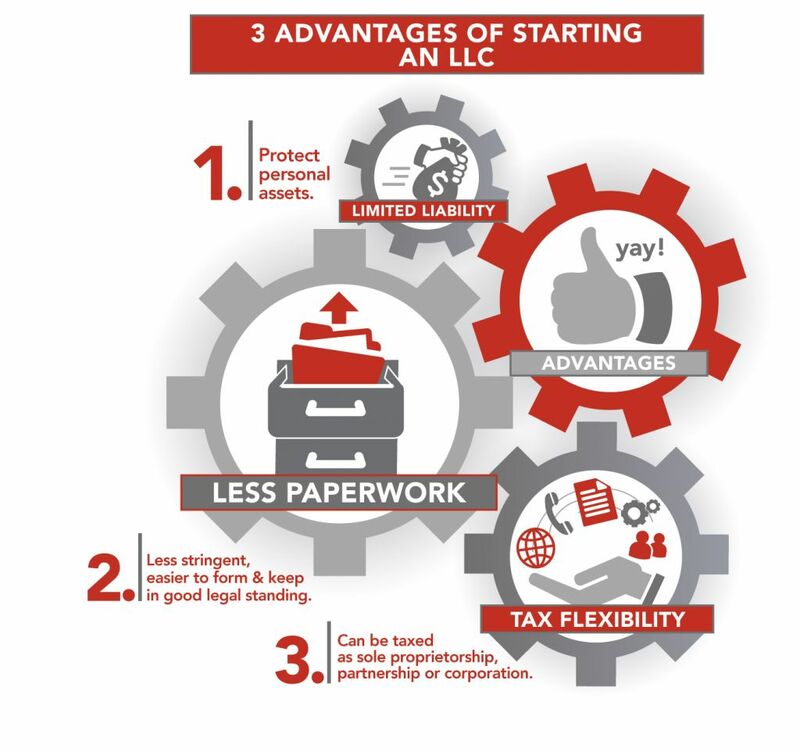 There is more flexibility on how the business is classified when it comes to taxes since an LLC is not recognized by the IRS as a taxing entity. If you choose not to tax your LLC as a corporation, it is considered a pass-through business and the taxes are passed through to the owners. This means that the net income is divided equally between owners and each owner will pay that share’s tax on their personal income tax return. In some cases, LLC owners may end up paying more taxes than corporation owners would since profits are taxed instead of salaries. In some states, the departure of a partner may force an LLC to dissolve. Ownership of an LLC is harder to transfer than that of a corporation since there are no shares of stock that can be sold and altering ownership must be approved by existing LLC members. If members do not buy the departing partner’s interests at fair market value, the LLC may be dissolved. 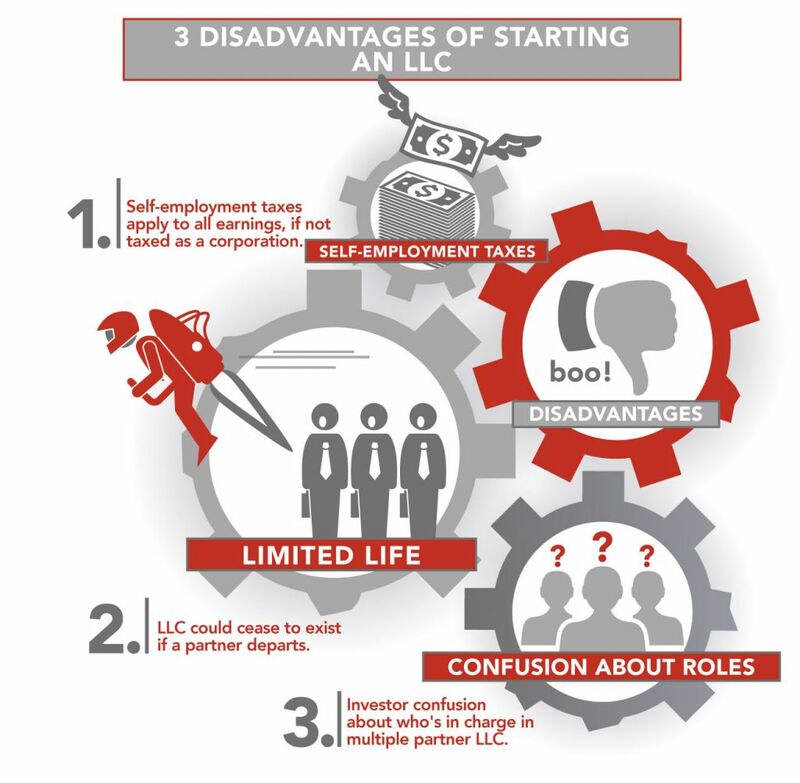 Single-member LLC ownership is straightforward since one member has all decision-making power, however, multiple-member LLCs can be more complicated. Without clear guidelines of the rights and responsibilities of company members in the Operating Agreement, disagreements can quickly arise. Whether deciding to categorize your company as an LLC or incorporating, Simply Counted can help you get started. Our strategic business consulting can advise on the formation of a new business, while our CFO and accounting services will assist long-term to ensure that your day-to-day operations run smoothly and efficiently so that you can focus on what makes your company unique. This entry was posted in Tips on March 7, 2019 by Nicole Vesota-Johnson. When you incorporate your business, it creates a separation between your personal assets and the assets of your company. Reducing this liability means things like your home, vehicles, and personal savings will be protected. Rather than paying self-employment taxes at the end of the year for a non-incorporated business, you gain the advantages of a deductible salary in an incorporated business. And for Sub S corporations, you’ll avoid double taxation on dividends. In addition, employee benefits for both yourself and your employees – like health insurance, retirement accounts, etc. – can be deducted from your annual taxes. In the end, the goal of any business is to make money! Incorporated businesses make it easier for you to raise capital so you can grow and expand. Hiring new employees, purchasing equipment, and expanding the workplace all typically require increasing capital and could have you hitting new benchmarks that may unattainable in a sole proprietorship status. This entry was posted in Tips on October 1, 2018 by Nicole Vesota-Johnson. This entry was posted in Tips on March 30, 2018 by Diana Kasza. By now, you’ve received (and sent out) various tax documents, statements and even email notices advising where to retrieve your tax documents. So much information . . . how to organize it all? Here are a few tips on how to organize the source documents and tax information you create and receive. Source Documents – What Are They? Source documents are critical to supporting business activity as it relates to a tax write-off. We have seen the IRS disallow expenses reported on a tax return that are not supported with a paper receipt. Keep this from happening to you! Saving these valuable documents electronically has become more convenient – you can do so on a desktop drive, a server, data drive or in the cloud. All valuable source documents (revenue receipts, expenses, loan documents, accounting data files, etc.) must be retained for 5 – 7 years, per the IRS, for any potential audit purpose as well as company reference. Online access to bank records, credit cards, Amazon, PayPal accounts, etc, brings with it an assumption that these documents will be there forever – or at least the next 5-7 years – if needed. However, this is not the case. For example, many banks will only have an account’s bank statements available to access for 12-24 months. Any statement beyond that period will cost you money to retrieve. Retrieving these documents during an audit adds unneeded stress to an already stressful situation. Handling record retention on a daily or weekly basis in a central location by creating an electronic filing system reduces this stress. The universal document format for email and online receipts is Adobe Acrobat PDF. CutePDF Writer is a great tool you can install to convert documents to this format. The program acts as a printer – when you “print” your receipt using CutePDF Writer, it saves the page or document as a PDF file. This will allow you to keep your digital receipts accessible over time, even if the software that originally supported the document disappears. Interested in getting started this year? Read How to Organize Your Computer Documents. You can download a PDF containing all of the information above for future tax seasons! Download our tax document organization guide here. Be sure to check out our resources page for a wealth of financial resources for small businesses. We also have business tax planning guides that will assist with many of the common issues found when doing taxes, and can help you save money on your business’ tax returns! This entry was posted in Tips on March 3, 2017 by Diana Kasza. Purchased “big-ticket items” such as a car, boat, motorcycle, motor home, travel trailer, etc. Made large home improvement purchases such as windows, roof, etc. Note that you can write off sales tax based on your actual receipts or use a more convenient state-by-state table. If you opt for the table, you can still add the sales tax paid on certain “big-ticket items,” such as cars and boats. Working from home is becoming more popular, so if you work from home, you may qualify for a home office deduction. If you anticipated this and kept detailed records, you may be entitled to both the home office expenses and a portion of the entire home’s expenses which is based on a percentage of business use in the home. However, if you didn’t keep detailed records, you can use a formula equal to $5 per square foot of the home office, up to a maximum of $1,500. Please contact your tax adviser before using any of the above suggestions. Your tax adviser can help you make the best decision by performing a side-by-side comparison of your options, discuss the pros and cons, and help you make an informed decision. For assistance with your income tax preparation, please contact a qualified accountant at Simply Counted in Holland, MI. This entry was posted in Tips on June 21, 2016 by Diana Kasza.